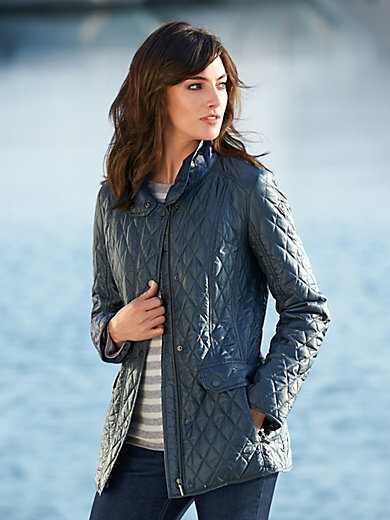 Quilted jacket by Fuchs & Schmitt – a lightweight between-seasons jacket made of lightly padded microfibre, to go with any style. The filling consists of an innovative, feather-light thermo fleece quilting: warming, breathable, water and wind-repellent. The adjustable collar can be high-closed with press studs. Skilfully placed lengthwise seams at the back make an attractive, slender silhouette. Concealed zip and row of press studs, 2 zipped seam pockets with horizontal flap and press studs. Outer material, filling and lining in 100% polyester. Length approx. 28ins. The jacket is machine washable.